Meet Rio (the one in between Daniel and Robbie). He has come every night and was determined to come every night. He is from Japan, a high school student at HMA and is studying English there. He has no Christian background – in fact his family is Shinto. At first he had no interest towards Christianity, however, as time passed he said he began to have interest in Christianity. About a couple of months ago, Daniel went to the ESL Bible class at HMA and did a little magic trick that tied in with the Bible. 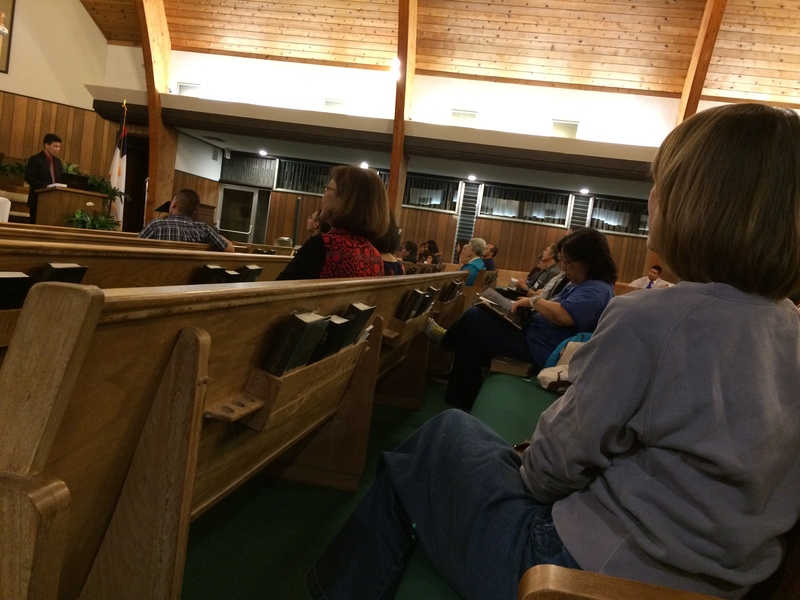 At the end, Daniel asked for interest in Bible studies… Rio was the first one to raise his hand. 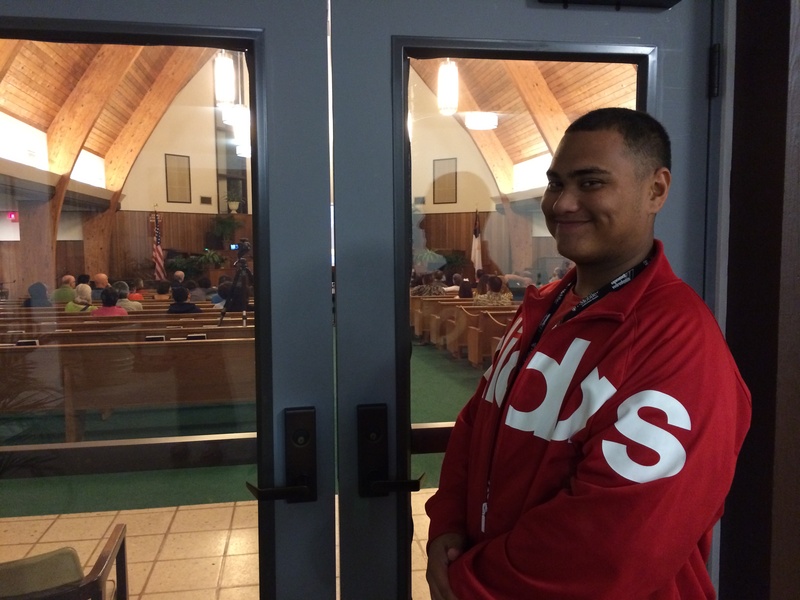 At the series, he said he wants to get baptized as a Seventh-day Adventist Christian. Rio is on fire, hungry for the Word of God, and is eager to learn more about Jesus. Please keep him in your prayers as he begins his Christian journey. Meet the Furuto Family. They are a genuine family wanting biblical truth. Just recently, Al Furuto was looking up Adventism on the internet and saw that we kept Saturday as the Sabbath day. After we saw him, he was basically telling us of how the other churches were not keeping the Sabbath day as Saturday and that they were basically breaking the commandments of God. He really loves how Adventists try to keep close to the Bible as much as possible. Both him and his wife stood up for baptism on the last night. Every night there were set teams for different nights. They ALL were good teams, helping people feel comfortable, registering them, showing them where to sit, etc. We worked with a very cooperative group, and we couldn’t have asked for a better team then these people. Every night Uncle Walden was faithfully coming into the meetings and setting up the audio for us. We loved his jokes that would make us laugh 🙂 And for the visual: Pastor, Robbie and Miguel would try their best in making sure everything was recorded and streamed. From sunshine to rain, they were a happy group of people. They helped everyone with what ever they needed help with. Ready to serve when given an order. These Men of Valor were a big blessing to have to make us feel like home. An army cannot run on an empty stomach! Every night these people would prep and clean-up the food. They were faithful to the end, and the people were happy with the amazing food given to us every night! We are very thankful for the children’s program. For the kids that went to the children’s program, they were blessed even though they weren’t able to “attend” the meetings. Every night there was a children’s program, and sometimes a guest would appear out of no where and they needed their child to go to the children’s program. Here is a playlist of meetings that have been recorded. To select which video you want to watch, first click the “play” button in the middle of the video screen and then click the “playlist” button located on the top left of the video screen. What a Journey. What more can I say? People Registered: About 110 people. Average people coming a night: 50 people. There has been 6 meetings so far, and now we have 10 left! We’ve talked to one individual and they started tearing up after the messages that were given, we have about 2 people who are really wanting to be baptized, non-adventist people are inviting their friends to the series, we have a good group of people consistently coming to the series, people who have questions and wanting answers. Every night we have been giving free prizes/free gifts. Just this past night we gave a special prize to those who came 5 nights! Those who won had an option for either a “Prophecy Set” or a “Peace Set”. God has been blessing, and this has been an amazing journey. We appreciate the prayers and we ask that you may keep us in prayer and the people in prayer. More prayer means more power! We are excited to see what more blessings God has in store as we go on with the rest of the Series. What a journey, what more can I say? Meet Blayne and Ty. Blayne searched for an Adventist church because he wanted to come back to Adventism. He saw there was one in manoa and he also listened to Pastor Mark’s sermon online. One Sabbath they came, Robbie was preaching and Daniel was translating that day, they were convicted of the message and they both went out with us on outreach that day. One desires to renew and further their walk with God and the other recently became a Christian. Out of no where they came and it was a Sabbath Blessing for all of us. The Flyers came in last Wednesday, and the Bible workers have been passing these flyers out ever since. 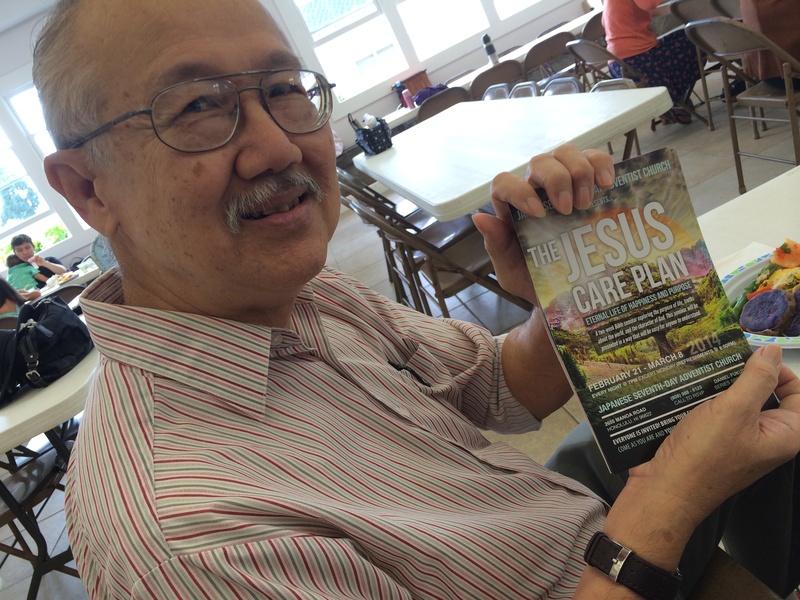 Just yesterday (Sunday – 2/9/14), the Bible workers from the Aiea church came and helped us pass out these flyers. We were able to pass out 2 boxes and a little more! That is about 3,000 flyers from JUST yesterday. 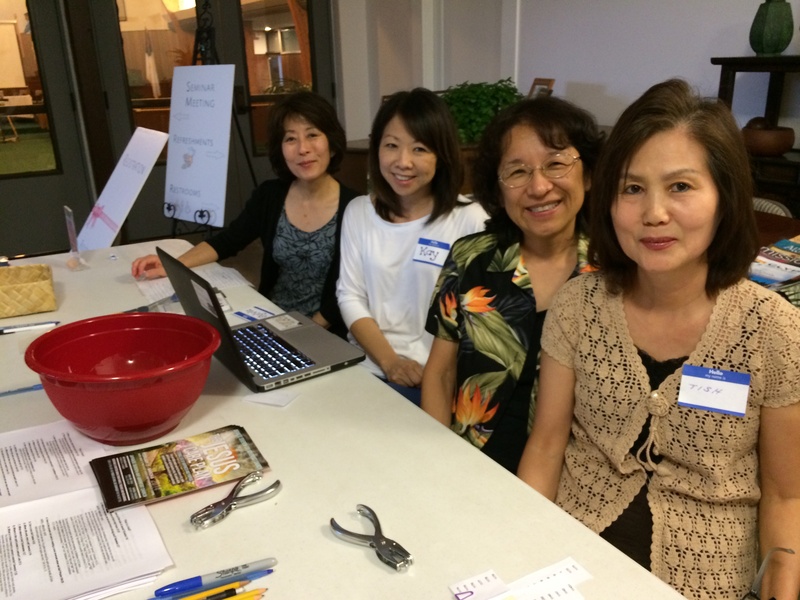 This past Saturday we invited the church members to participate. 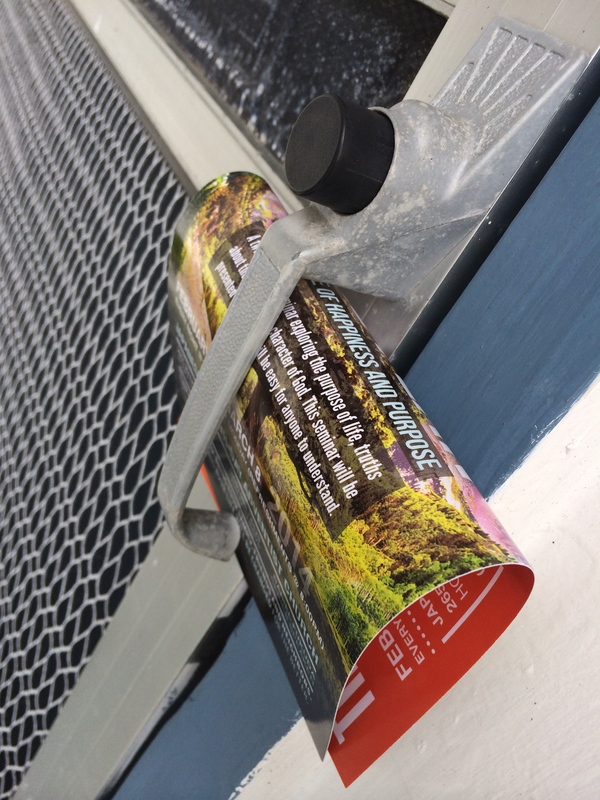 Their goal was to give somewhere between 10-20 flyers each! Not only that, but we had a church outreach as well, where they had a chance to go door-to-door passing out the flyers. Meet one of Robbie’s first few contacts. He has accepted the Sabbath, is going to church every Sabbath, and is willing to pass out a few flyers to his family and friends. Praise the Lord! Clifford has been a blessing and the church members have gotten to know him more and more as he continually comes. She used to give Bible studies and actively do mission work in the Philippines. She was inspired and encouraged that a young person is actively doing ministry. Daniel has been studying the Bible with her, her husband, and the patient since the first week. In this picture they were studying Daniel chapter 2. Since they have been studying the Bible with Daniel, they have been enjoying the studies and have seem to study the Bible more for themselves now!